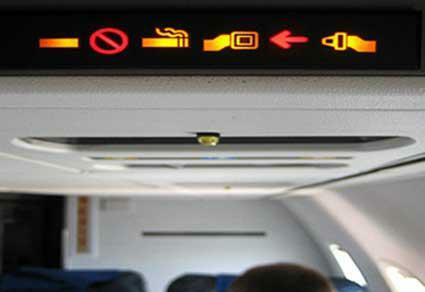 Ever wondered about the rules and regulations surrounding flying abroad with your e-cigarette? If you haven’t, then it’s certainly time you brushed up on your legislation so that you don’t get caught out vaping somewhere you shouldn’t. Put it this way, you don’t want to take a plane to somewhere in South East Asia, take a quick hit on your trusty e-cig only to wind up in trouble with the law. The punishment for vaping out of turn in certain countries varies from a slap on the wrists, right up to imprisonment in some cases. Can I carry my device as luggage? Most UK airlines will let you travel with your e-cig but some do have issues with the lithium ion batteries. If you’re travelling with both, it’s best to keep the battery in your main luggage rather than your hand luggage. EasyJet, Ryanair and British Airways will all allow you to travel with small containers of e-liquid as long as it’s under 100ml. You can carry this in your hand luggage so long as you empty it into a clear plastic container before checking it through. If you’re carrying powerful batteries then just give them a call in advance to double check. Our friends at the Daily Mail recently reported a luggage fire started by an e-cig battery, so always check to be safe. Vaping on the actual air plane is pretty much a no-go area across the board. The only company that allows you to vape on board a plane is Ryanair. But don’t get too excited – Ryanair won’t allow you to vape with your own e-cigarette, you can only use the smokeless cigarettes they sell on board. Judging by the reviews and comments I’ve read regarding the quality of these products, they seem pretty sub-standard. If you’re flying with Qatar Airways then it’s probably best not to take any risks at all. People have been arrested for vaping on their airlines! If you’re planning on going vigilante and sneaking in some vaping whilst on board your flight, just beware that some vaping devices will trigger the fire alarms in the toilets. We don’t recommend doing this, as you could incur a fine or land yourself in hot water with your airline. Surprisingly, the reasons that airline companies have quoted for banning the use of e-cigarettes on planes is nothing to do with second hand smoke concerns, but because they fear it will confuse other passengers and trigger tobacco smokers to light up also. It actually appears that the UK airline industry does not buy into the notion that second hand smoke from vaping is harmful – Quite refreshing when you consider some of misleading stories out there about the effects of second hand vaping. Passengers are permitted to use electronic cigarettes within our premises, however, these should not be used beyond the gate area. Where you are intending to carry cigarettes in your hand luggage, please check with your airline to ensure they are allowed on board the aircraft. 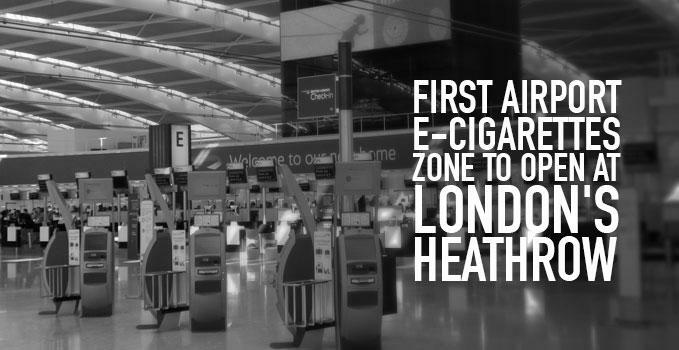 This is not the case for all airports though; Gatwick, Manchester Airport and Birmingham international do not permit the use of e-cigarettes anywhere within the terminal building. Foreign airports have very different rules so don’t just start vaping straight away once you land, ask a member of staff what the policy is, or check in advance. There have been occasional instances where people have been stopped abruptly at security due to the appearance of their e-cigarette device. Most of these cases occurred a number of years ago, when e-cigarettes were less common. One woman got stopped because the security team thought her device was a bullet! Think from the perspective of the security guard who doesn’t know much about the products. If you’ve got a strange looking MOD that could raise suspicion, just briefly explain to the security staff that you have an e-cigarette device in your luggage and everything should be ok. Your best bet is to disconnect the atomizer from the cartridge and pop it in the tray, this way if anyone asks you can quickly explain rather than security staff having to look through your bags and panic about what might be inside. Buy E-liquid before you travel – you may not be able to buy it when you’re abroad. Also many foreign countries do not have the same level of testing for products that we have in the UK, so be safe and buy good quality liquids from a reputable UK supplier. Disconnect all of your batteries from your atomizers/cartridges – this will make going through security easier and will stop your e-cig turning on by mistake and using your much needed battery life! Only pack what you need – if you’re going on a short holiday don’t load your back with cartridges, chargers and battery packs. This will only raise suspicion levels. Be prepared to deal with different attitudes towards e-cigarettes – some countries are not as liberal as the UK when it comes to vaping so make sure you know what you’re talking about and stay calm if questioned. Contact your airline company in advance and check their rules about e-cigs and devices. If you’re planning on travelling abroad with your e-cigarette then make sure you check out the specific rules and regulations in the country you are travelling to. 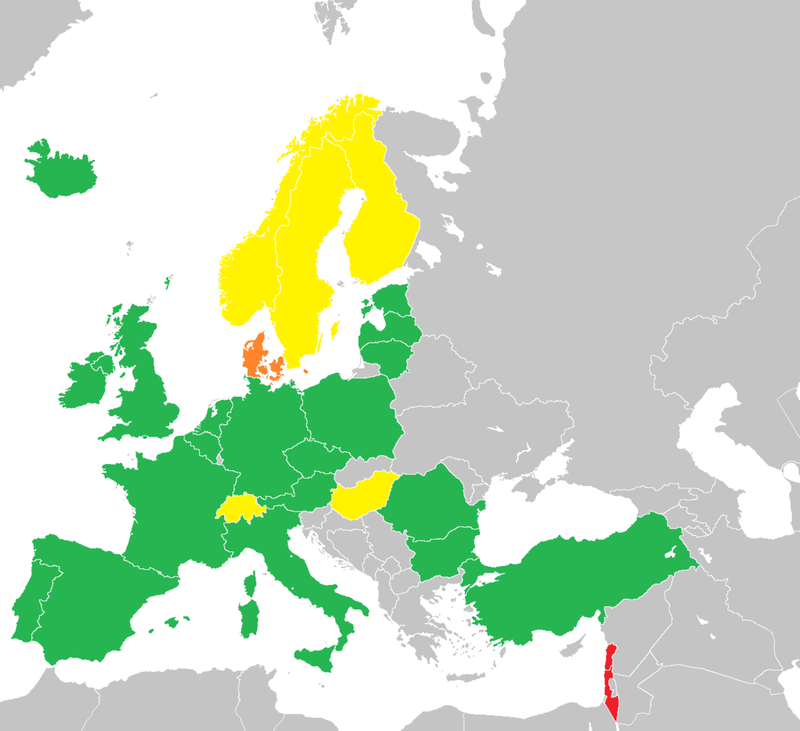 Have a look at the below website for a full breakdown of each countries policy towards e-cigarettes…. In general Europe is pretty lenient with vaping, but there are one or two exceptions. Always double-check your holiday destination prior to travel. Yellow = E-cigarettes that contain nicotine are illegal. Only nicotine-free e-cigarettes are legal. Other countries like Brazil, Columbia, Singapore and Indonesia have all banned e-cigarette usage, with other countries like China restricting the sale of e-liquids. Remember be safe and do your research before you travel! E-cigaret in GREECE is UNRESTRICTED to import, sale and use. Can I carry my new unopenned ECIG vape in my checked in luggage or hand luggage on a flight to and from Oman.